Image: Lakeshore Entertainment, BRON Studios, Amblin Entertainment, Steve Bronstein/Getty Images. Design: Ashley Britton/SheKnows. 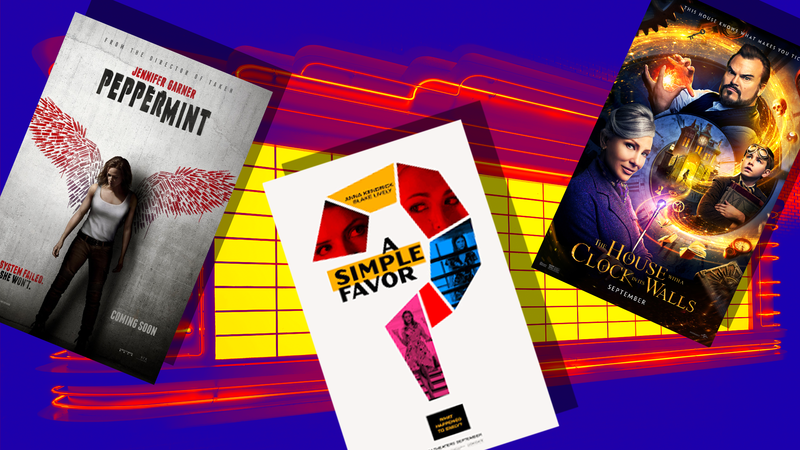 The end of summer is quickly turning to fall, and every movie lover knows fall is when the best movies of the year get released. This year, September at the cinema will see multiple revenge flicks, including Peppermint, starring Jennifer Garner, Lizzie, based on the true story of a woman who hacked her parents to death with an ax, and Assassination Nation, about a group of teens who take matters into their own hands when their texts and emails are hacked. If those aren't to your liking, this September there are also two documentaries about women who broke gender barriers in comedy and rock and roll. A beloved classic book, Little Women, gets a modern-day remake that stars Lea Thompson, Sarah Davenport and Allie Jennings, and another book adaptation is A Simple Favor, starring Anna Kendrick and Blake Lively as two best friends sharing some very dark secrets. Here's our list of the best movies coming to theaters every weekend in September. Riley (Jennifer Garner) seeks justice after her husband and daughter are gunned down by a Mexican drug cartel. But as she works her way through a legal system tainted by corrupt judges and dirty cops, she decides to take the law into her own hands. We’re excited for this movie because Garner gets to return to the action scenes we came to know and love when she was on the TV show Alias. In this off-kilter horror movie, Red (Nicholas Cage) is obsessed with getting revenge on a terror cult after they kill the love of his life. We're so curious to see this film because the trailer looks absolutely freaky. Starring Matthew McConaughey and Jennifer Jason Leigh, this movie is based on the true story of Richard Wershe Jr., a teenage undercover informant for the FBI who got caught trafficking drugs in the 1980s. We can’t wait for this movie because the story sounds fascinating (and we also love '80s music). This movie is a retelling of the shocking story of Lizzie Borden (Chloë Sevigny), the woman who hacked her parents to death with an ax in 1892. Kristen Stewart plays her lover, and we’re so excited to see the chemistry between two of our favorite actors. In small-town America, a mommy blogger (Anna Kendrick) attempts to solve the mystery around the disappearance of her best friend (Blake Lively). We’re thrilled to see this movie because Kendrick is just so talented, and we loved the book that inspired the film. A boy (Owen Vaccaro) and his quirky uncle (Jack Black) must find a mysterious evil clock hidden inside a house that's straight out of a Tim Burton movie. We can only imagine the intriguing oddball rooms and objects in this strange house and how they’ll add fun and fantasy to the story. Cate Blanchett also stars. Odessa Young, Hari Nef and Suki Waterhouse play high school buddies whose small town implodes when 17,000 people’s emails and texts get leaked. This movie is definitely a cautionary tale for teens living in the digital age. This ensemble film tells the multigenerational story of the journey one family takes to find love and stability. Set in both New York and Spain, the film features an international cast that includes Olivia Wilde, Antonio Banderas, Annette Bening and Laia Costa. We’re enthusiastic to see this movie because it’s written and directed by Dan Fogelman, the writer/producer of the TV show This is Us. This documentary weaves together lost audiotapes and interviews of Gilda Radner, a comedic genius, taken from the world much too soon. We want to see this movie to understand what inspired her hilarious work on Saturday Night Live and how she advanced women in comedy, a genre typically dominated by men. Kevin Hart plays a brilliant salesman who goes back to school with the hope of becoming a stockbroker. His night school teacher is played by comedy's new it girl, Tiffany Haddish. Why are we desperate to see this movie? Two names: Hart and Haddish. In this reversal of the Bigfoot story, a yeti becomes convinced that small, intelligent creatures called humans actually exist. This movie looks like a very clever take on an old myth, and it features the voices of Channing Tatum, Zendaya and James Corden. This movie imagines what the March family from Louisa May Alcott’s classic novel would be like in 2018, with social media, cars and online dating. We already know and love these four sisters. Lea Thompson plays the matriarch, Marmee. This documentary tells the story of how Joan Jett blazed a trail for women in rock and roll. From bad reviews to shocking physical violence, Jett never let anything stop her from following her dream. We’re excited for this movie because Jett is still a role model for women everywhere who want to live and play in a man's world.